On-site, turn-key installations — Our factory personnel provide installation, complete with on-site operator and maintenance training. Single-cabinet receiver — Radio receiver, electric and pneumatic interface are all in ONE cabinet. Simple maintenance — Total modular design incorporates onboard diagnostic circuitry that allows rapid identification and correction of problems, which minimizes the need for costly multiple work crews. Off-the-shelf industrial hardware — You never have to wait for custom parts. Transmitter fixed/portable — Operate in both portable and fixed modes. TMS (Time Multiplex Signaling) — Multiple systems can reliably share the same licensed frequency. Compact receiver and transmitter — Easy to handle; space efficient. Typical range 700 to 2000 ft. in portable mode; 2500 ft. in fixed mode — Allows for maximum flexibility. Modular receiver design — Quick and easy installation and maintenance. Self-check pneumatic program — The unit tests itself every time it starts and verifies at all times that it’s measuring the proper air pressure for safe operation. Integrated pneumatics with quadruple-filtered air supply — It reduces the risk of contamination of control hardware for extreme reliability. 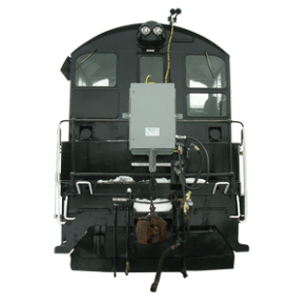 Tilt switch — If the operator becomes disabled, this safety feature shuts down the system and sets the brakes on the locomotive. 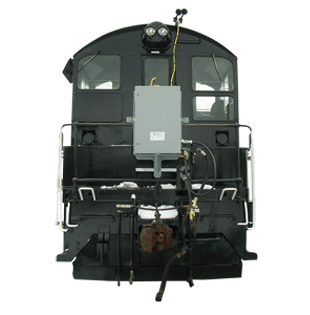 Broad range of braking functions available — Braking functions include independent braking, train braking, automatic braking, independent brake bail, drag brake, and throttle against train brake. Broad operating electronic range — From -22°F to +158°F (-30°C to +70°C); RHO to 95% non-condensing. Stainless steel receiver cabinet for outdoor applications — Weatherproof, NASA-type shockmounted system is easily maintained by your personnel for durability and long life. Push to Operate (PTO) palm bar option — The brakes can only be released while the operator is depressing the palm bar. Once the bar is released, the brakes will set. Low temperature units available for pneumatic — Available for severe applications from -30°F (-34°C) to +32°F (0°C).